dealtavern has no other items for sale. EA's keystone football franchise debuts on PSP with a game designed to play along with the PS2 console version of the title. Players can sync up with their PlayStation 2 editions of Madden 06, to transfer up to a week's worth of franchise games onto the handheld. The full-featured handheld football game is designed to stand on its own as well, however, with solid Madden gameplay, new 3D graphics, and teams, rosters, and arenas based on their real-life NFL counterparts. The PSP edition of Madden 06 also offers 18 mini-games, and multiplayer matches supported through local Ad-hoc wireless connection, or against gamers across the country through a wireless Internet hookup. Editor's Note: A problem was discovered with the PlayStation Portable version of Madden NFL 06, soon after its September 2005 release. A glitch in the game's franchise mode could cause the handheld to unexpectedly power-down. In December 2005, EA Sports announced it would replace the buggy UMD with a patched copy of the game. Gamers wishing to exchange faulty PSP copies of Madden 06 should contact EA's Customer Warranty department. Great game, make sure you don't get a defective one! Madden NFL Football... just the thought of Madden on the go was enough to send me and other fans into a drooling frenzy... well maybe not, I don't really drool, er... you get the idea. I got this game the day it was released, and was astounded. I have played Madden on GameBoys, but the PSP port blows away its handheld counterpart. The graphics in Madden 06 are amazing, almost as good as a console version! I couldn't believe my eyes when I first played a game, as everything was in 3D, unlike previous ports. EA definitely made use of the PSP's capabilities in this aspect. Sound in this game is typical of most Madden games, nothing bad, but nothing great. Overall it does add to the football experience though. Gameplay in the PSP Madden is the best part of the game, as it is comparable to the console versions. Season mode is especially fulfilling, as you can draft, sign, and train players to build your ultimate superstar team. The various difficulties are challenging... not too easy, yet not impossible. Although Madden NFL 06 was put together into a great port package, there is one flaw worth mentioning... there were many, many glitches in the first releases of the game. I believe the later releases fixed some of the bugs, but they are still worth mentioning. At the end of games, the game would SHUT DOWN your PSP before you could save... so you had to save before you ended the game, then let it shut down, then reload and play from there. Also, some games shut down randomly. Training camp didn't always save your stat upgrades, and sometimes in-season upgrades didn't save as well. So if you're going to buy Madden, make sure you get a newer copy... one with most of the bugs fixed. These bugs are the only reason I didn't rate Madden 5/5. 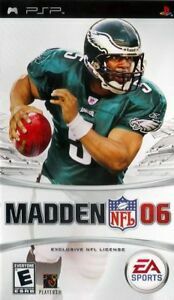 Overall, Madden NFL 06 for the PSP is a great game, revolutionary for a port football game. If you're a football fan, this simply is a must have. Great graphics and awesome gameplay will keep you busy for months. Buy! Looking For A Football Game? This Is Your Only Choice. Great Game Don't get a bad one!!!! This game has great graphics on the psp and the franchise mode is awesome!!! The announcing is the same as any other console (ex xbox ps2) nothing overwhelming about the game but it has great graphics. The ONLY bad thing is when Madden released the game first for psp it had a defect. The game would pause and have tons of glitches, and at the end if a game that you played it would just automatically shut down. This is the only reason I gave it a 4 rather a five. In other words great game but make sure you don't get a defected one!!! Madden always puts out a great game. But if you're use to playing on your xbox or playstation, then you'll notice that there's a longer loading time with everything. Like when you're choosing a play, or after a play has been done, or waiting for results when you're in trade block the loading is there. Still you get used to it if you're patient. Graphics are just like PS2, there are more Training Camp drills (i liked that), it has all the Franchise Mode features you see from the other cosoles, but there is no Pro Bowl, Horse Trailer, Newspaper or Fan meter. Still if you're a Madden Freak you know you're going to buy.